Join us for this unique journey with an ex-GWR Castle Class Locomotive. This classic express train operated by the Great Western Railway still exists today, however we hope to rekindle the nostalgic memories with a journey by Steam. Volume 1 begins its journey from Didcot, and we travel through Oxford before turning left along the line through the Cotswolds. As speed along the mainline our locomotive tears through open countryside catching the beautiful sunset as we climb to Chipping Campden before speeding down Honeybourne Bank and into the twilight before arriving at our destination of Worcester. 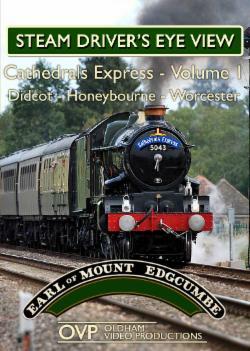 In Volume 2, we hope to continue the journey between Worcester and Hereford, the original route’s final destination. With live sound recorded from the locomotive, we bring the action right to you. This program also features commentary, on screen titles & locations.